Recently renovated and updated with the latest appliances and conveniences, villa UJV 400, or La Colombe d'Or, is a haven of tranquility. Located in the exclusive gated community of Mont Jean, this luxurious five bedroom villa is on a large, level lot (very unusual for St. Barths) which allows for a very spacious open plan, with large rooms all on the same level. The sizeable living room, with stunning dining area and modern kitchen opens onto the beautifully landscaped yard surrounding the main pool and terrace. The elegant master bedroom shares this view out over the main pool, terrace and yard. The remaining four bedrooms (among them a second master bedroom), are thoughtfully located for maximum privacy, and connected by an exterior walkway which wraps around the property. 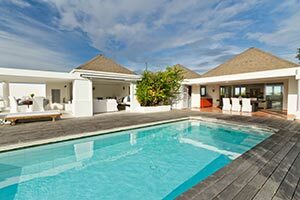 A second pool is located at the northern edge of the property with exhilarating views out over Pointe Milou and beyond. This property affords total privacy in a most desirable location. It is truly a gem of the Mont Jean community.